In recent years, cats and dogs seem to have become more sensitive to a range of substances they come into contact with, either in the environment or through their food. Dogs appear to suffer from food allergies more than cats and changing to a more natural feeding regime, to reduce the additives given, has proved helpful. Please contact Scrufts K9 nutritional experts for more information. For contact allergies the only real solution is to identify the cause and restrict the animal?s access to it, although this can prove difficult in practice. 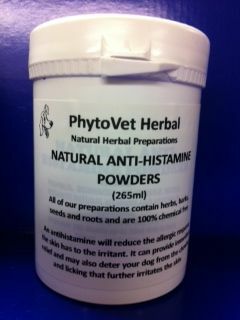 Many food allergies in dogs present themselves as a skin irritation and this can result in a minor infection which can be treated with PhytoVet Herbal Fenugreek & Garlic which will also help to remove toxin accumulation in the body, together with Mixed Vegetable tablets to reduce the irritation; both should be given at the treatment dose. Also see our section on Skin & Coat for further advice. An antihistamine will reduce the allergic response the skin has to the irritant. It can provide immediate relief and may also deter your dog from the chewing and licking that further irritates the skin.